On 28 June 1914, in the Bosnian city of Sarajevo, bullets fired by the Serb nationalist Gavrilo Princip killed the heir-apparent to the Austro-Hungarian throne, Archduke Franz Ferdinand. One month later, on 28 July Austria-Hungary declared war on Serbia. That day, river monitors of the Austro-Hungarian Danube fleet fired the first salvoes of the war at Belgrade. Three Austro-Hungarian armies, the Second, Fifth, and Sixth, assembled on the Serbian frontier to fulfil the slogan being shouted in Vienna: "Serbien Muss Sterbien!" (Serbia must die). However within days of mobilisation, Russian intervention on behalf of Serbia caused the Austro-Hungarians to withdraw most of their Second Army from the campaign. Despite this significant loss of strength, the Austro-Hungarian commander Feldzugmeister Oskar Potiorek proceeded with his planned attack and invaded Serbia on 12 August. This initiated a four month long, hard-fought slugfest on the banks of the Drina and Sava Rivers. During August and September, the Serbs were able to repulse several invasions and even crossed into Austro-Hungarian territory themselves. But as the campaign wore on, attrition and the lack of artillery ammunition took its toll. by early December the Austro-Hungarians seemed to have victory in their grasp when they captured the Serb capital Belgrade. However the Serbs counter-attacked and their supreme effort routed the Austro-Hungarian invaders and ejected them from Serbia. The campaign ended where it started with both belligerents utterly exhausted. 1914 Serbien Muss Sterbien, the Initial Campaigns on the Balkan Front in WWII realistically covers the battles fought in and around Serbia during the first year of World War One. 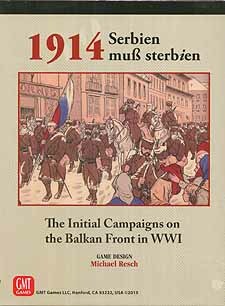 1914 Serbien Muss Sterbien (an Austro-Hungarian jingle that translates to "Serbia must die") is a comprehensively researched model that explores the intriguing set of campaigns fought in Serbia in 1914. The game includes an accurate order of battle and detailed game map. The map encompasses the primary theatre of war from Peterwardein in the north, Sarajevo in the west, to Aleksinac in the south-east. The game system used is the same as found in 1914 Offensive a outrance. The game has a playtested, concise and well-organised rules booklet. 1914 Serbien muss sterbien includes four scenarios, three historical and one alternative-history situation. The largest scenario, the Grand Campaign, covers the period from the initial Austro-Hungarian invasion of Serbia in August, to utter exhaustion and stalemate in December. The game design goal is to produce an enjoyable game from which players can learn a great deal about the campaign and the geography of the theatre of war.